Pros: A cracking cast, catchy songs and a very impressive skipping rope routine. Also, dogs on stage. Cons: If you don’t go in for musical theatre or fluffy things, this will probably give you an allergic reaction. Peppy fashion student and sorority sister Elle is heartbroken when her boyfriend Warner breaks up with her so that he’s free to pursue a woman who suits his ambitious plans for the future. In an attempt to prove that she can be the serious partner he is after, Elle decides to leave behind her fun-loving life in California to study law at Harvard (where Warner also ‘happens’ to go). Supported by her unlucky-in-love friend Paulette, teaching assistant Emmett and her sorority squad, Elle sets out to show the doubters – including the shark-like criminal law teacher Professor Callahan and Warner’s new girlfriend Vivienne – she’s more than just ‘Legally Blonde’. This musical adaptation packs the film’s feelgood story with upbeat, catchy songs and matching dance routines, basically making it the cultural equivalent of injecting your eyeballs with candy floss. 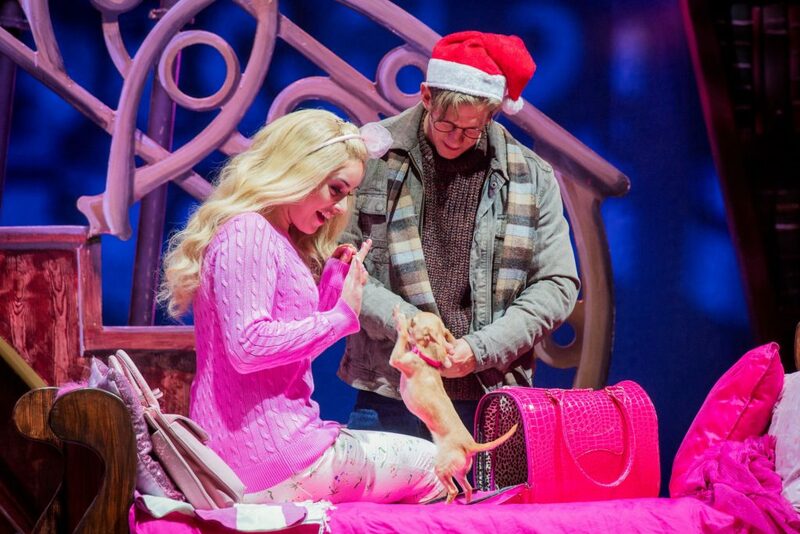 It is musical theatre squared, in pink. If you are not a fan of the genre, don’t even think of going anywhere near this. 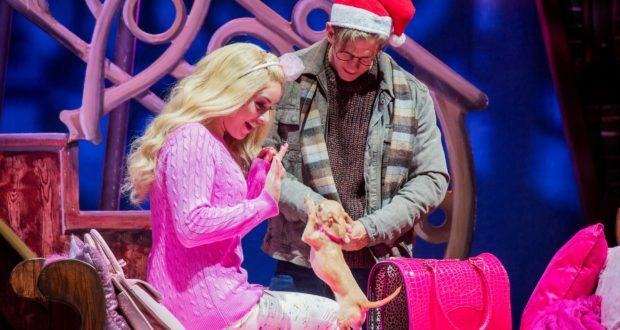 For everyone else, however, Legally Blonde is an infectiously fun evening out and musical theatre aficionados will appreciate the way the show lovingly pokes fun at some of the weirder genre conventions. People interrupt each other’s heartfelt solos. Elle’s sorority squad shows up in spirit form to comment on the action, because “this is a tragedy, and you need a Greek chorus”. It’s not plain sailing all the way. The sorority girls mostly talk in an annoying (and annoyingly cliched), high-pitched twang. The quality of the choreography is uneven. I get that to an American audience, Paulette’s view of Ireland as a country full of leprechauns and hot ginger men might be hilarious, but on this side of the pond it frankly just feels weird. Nevertheless, these are minor glitches in an otherwise fun, fabulous feelgood show. In summary: oh my god you guys, you should, like, totally see this.